It’s BBQ and grilling season for many of us, and a successful cookout is far easier with the right tools. We’ve checked out some of the best gadgets and accessories to give you a shot at becoming a grill master. What kind of accessories? We’ve kept it light and varied—sure, you could spend hundreds of dollars on the most expensive BBQ or grill out there, but we’re specifically looking at those small, relatively inexpensive extras that will enhance your current grill experience without necessitating a $500 smoker to get results.. 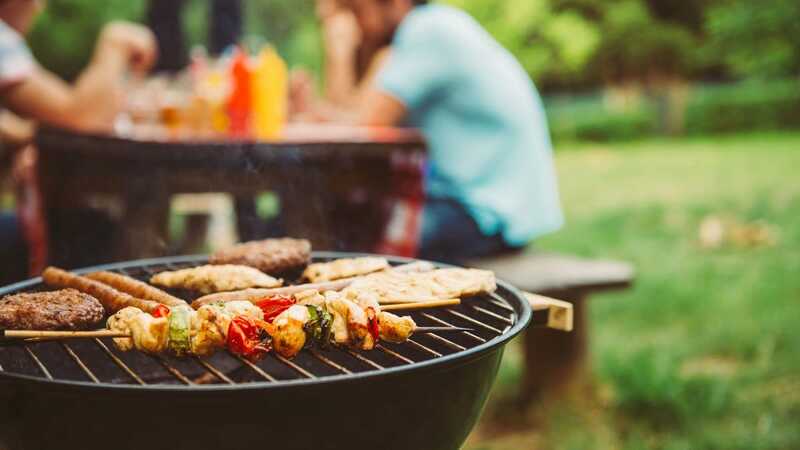 Some of the gadgets can easily be used in the home too, during those winter months when you won’t be lighting up the grill so often you can still get some mileage out of them. Here are some of our favorite gadgets to enhance grilling sessions big and small. Ok, so we’ve started out with an expensive gadget but it’s one that you can use indoors as well as on the BBQ. 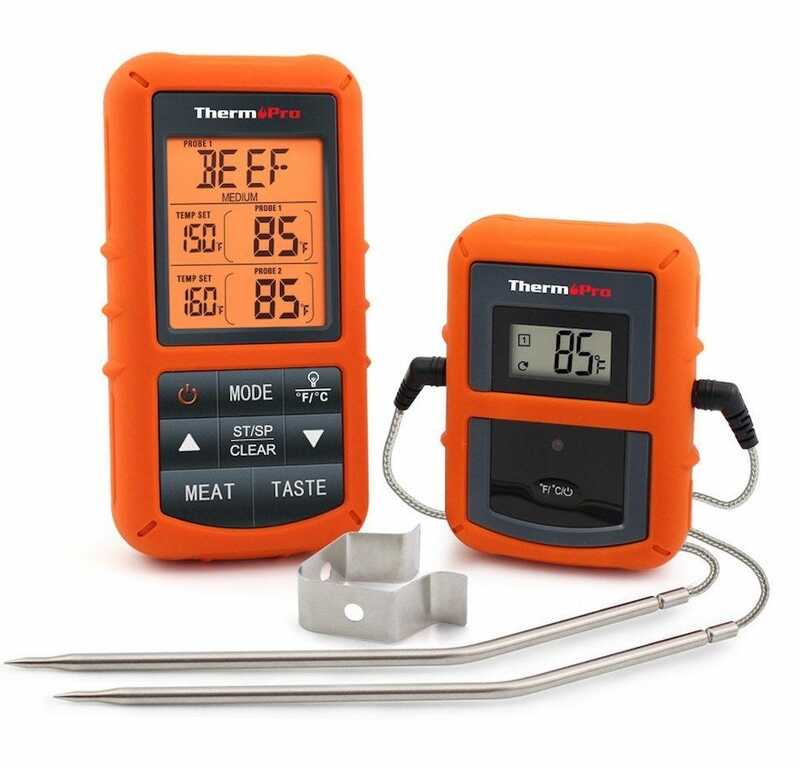 The ThermoPro Wireless Remote Digital Cooking Food Meat Thermometer is exactly how it sounds—it’s a wireless thermometer for measuring the temperature of any food you’re cooking. It has a dual probe monitor to ensure it’s consistently accurate at all times, with you able to step up to 300 feet away from the food while still getting feedback on how things are cooking. That makes it perfect for when you’re mingling at your party, but you still need to keep an eye on how the meat is cooking. 9 different presets are available for different types of meat, with each temperature recommended by the USDA. 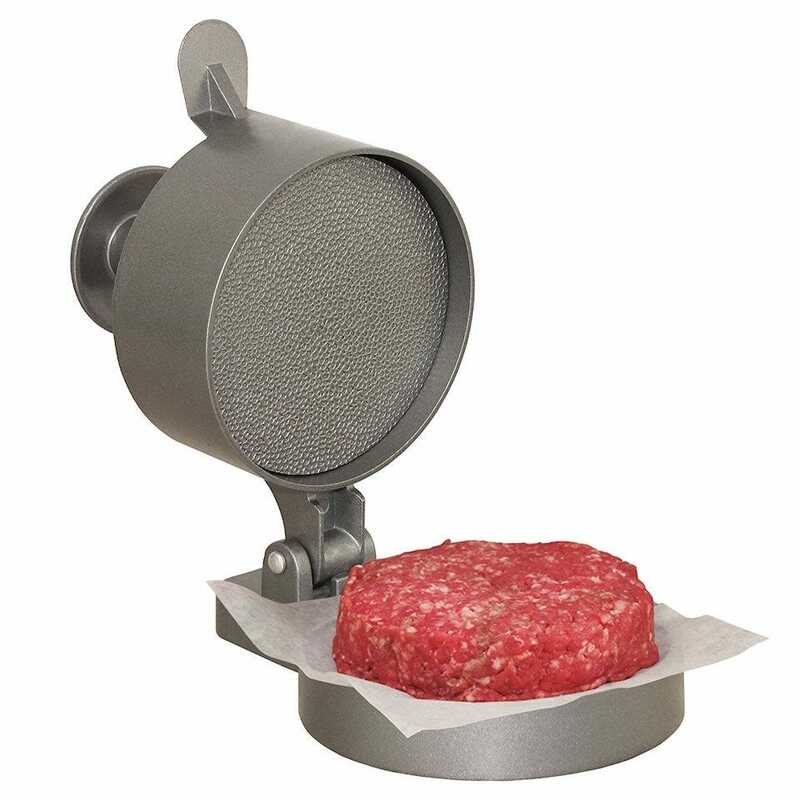 Cheaper Bluetooth based alternatives are out there, but this is the most effective form of meat thermometer you can buy—and when you finally throw the cover on the grill for the last time, you can take it inside and use it to monitor your perfectly roasted turkey. Sure, you can buy burgers ready prepared, but the best quality of burger is one that you press yourself. Preparing the mince and relevant spices isn’t so hard, but getting the right texture and look can be. The Weston Burger Express Hamburger Press takes out all the hard work here. Simply place your ground meat and seasonings into the press, and squeeze down. A spring plunger button compacts it tightly then pops back up quickly for convenient patty removal. Toss is onto the grill, and you’re good to go. The press promises consistent burgers that cook evenly and don’t fall apart. You can also adjust the thickness from 1/4 inch to 1 1/2 inch depending on what you prefer. Not all gadgets are cool and exciting, but this one is very useful. 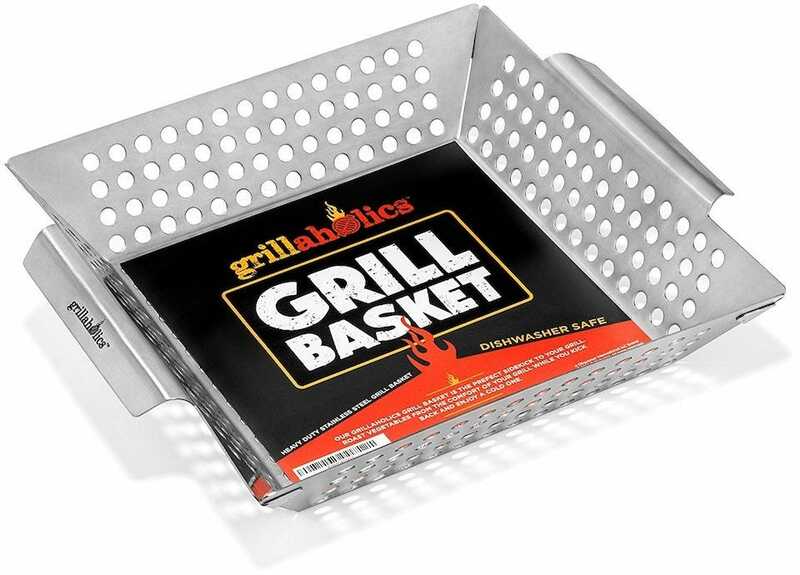 The Grillaholics Grill Basket is a container for placing your vegetables, shrimp, or diced meat inside, without worrying about it getting lost in the grill. Made from heavy duty stainless steel, it has holes that are large enough to cook food evenly, yet small enough to hold the food safely. Raised edges keep the food contained, and there’s plenty of room for you to store lots of food. It’s not the kind of thing you’ll show off to friends, but they’ll appreciate it when their shrimp isn’t lost among the coals, ready to be picked out at the end of the night. Burgers and steaks are great, but sometimes it’s nice to create a kebab skewer of meat and vegetables. Diced food has that nice bite-sized feeling to it, after all, and you can cook up some skewers much faster than larger hunks of meat. That’s why you need to purchase Master Cook Skewers Set of 12—stainless steel skewers that are as easy to use as they are to clean. They’re dishwasher safe and eco-friendly, thanks to their long use life. Again, they’re not quite as exciting as some accessories, but they’re a neat way of making your BBQ a little more varied than just the traditional options. Thanks to being stainless steel, they keep your food warmer than using wood or plastic based alternatives too. Plus, there’s no risk of bending them. 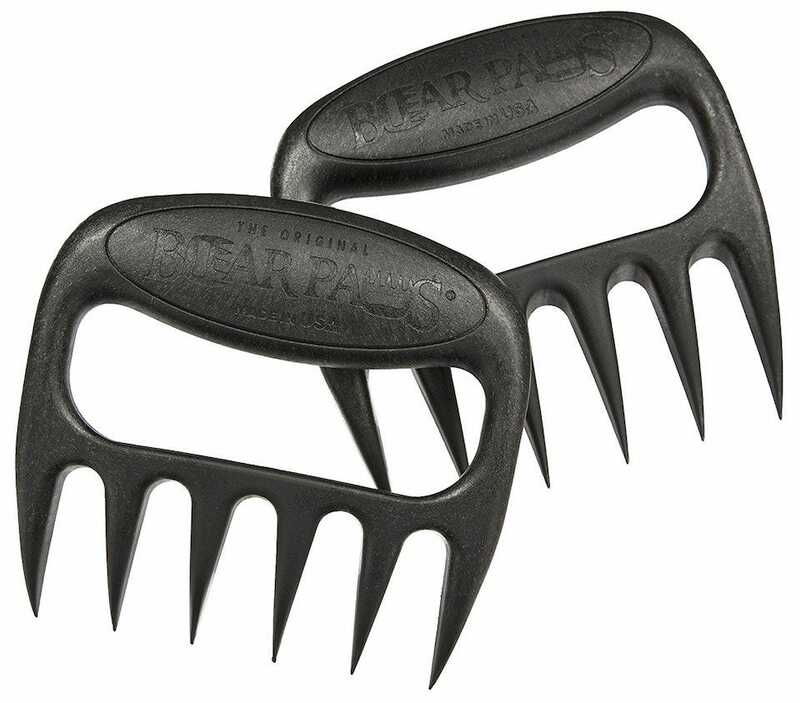 A popular accessory around here, Bear Paw Meat Claws are a fun and practical way of shredding and pulling apart meat. You can easily use them to grasp and shred pork, chicken, beef, and much more. I mean sure, you could stick to shredding your meat with some forks but come on—this is peak culinary fun. If you’re being a little fancier at your BBQ and working on some pulled pork, it’s the perfect way of shredding meat before placing it inside a burger bun. Otherwise, just use one claw to pin your meat down on the BBQ. It’s OK—these claws are melt proof so they’re good for those purposes too. That wonderful mixture of practical yet fun ensures these will be your new favorite utensil—and, just like the meat thermometer above you can use around the holidays, these claws make it super easy to shred up some left over turkey for delicious sandwich fixings. Kind of like how every workman needs a good set of tools, every avid BBQer needs a good grill set. The Cuisinart Deluxe Grill Set is that kit. 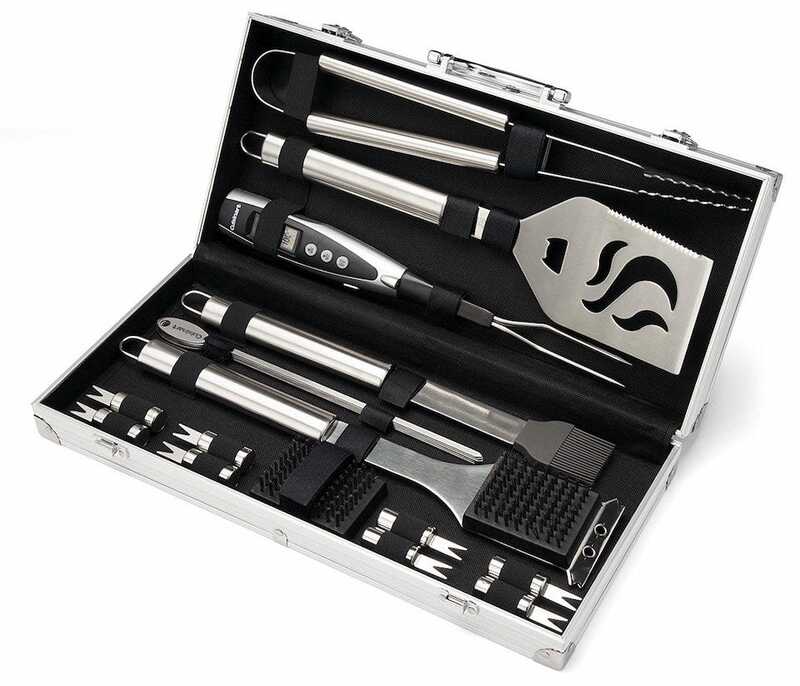 A 20 piece set, it includes a chef’s spatula, grill tongs, silicone basting brush, 8 corn holders, 5 skewers, a cleaning brush, replacement brush head, digital temperature fork, and a storage case. The kit is pretty much a one and done purchase for kitting out your grill with handy tools. Its digital fork alarm will tell you when food is done, and there’s even an integrated LED light for checking food at night. All the tools are perfectly weighted and comfortable to use, with little extras like the spatula having a bottle opener, making things even better. You won’t be able to remember life without it—that’s how useful it is. 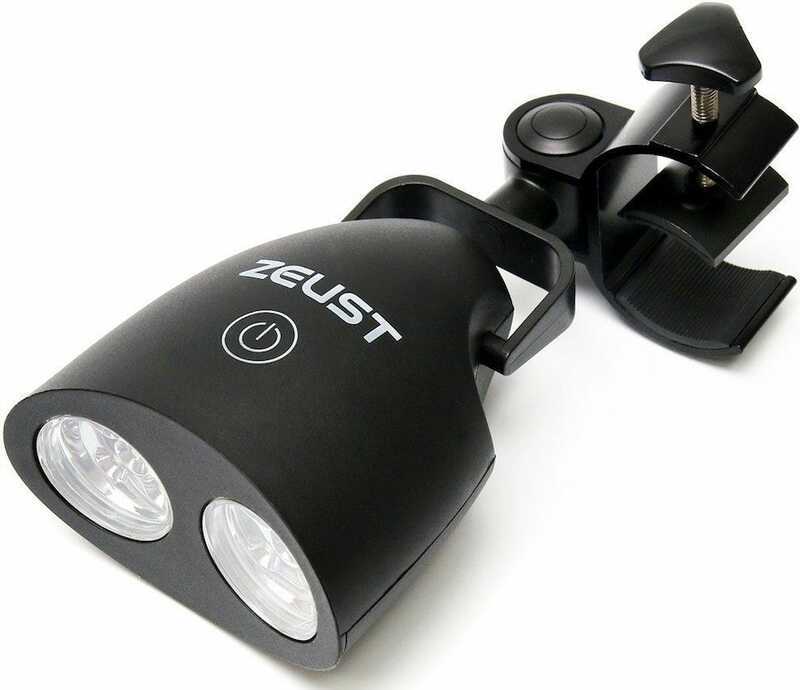 Simply attach it to your grill, and you benefit from nice focused blast of 105 lumens of long lasting light which give you a great view of your grill. There’s an auto-off feature too, for when you’re done for the night but forget to switch it off yourself. It’s so much easier than shining a flashlight over the surface while trying to balance a plate and tongs at the same time. BBQs don’t have to just be about meat and burgers—you can easily cook a pizza on the grill too. The Heritage Pizza Stone simplifies the process by offering you an effective surface to place the pizza dough on. It pre-heats up to two times faster than other pizza stones, and doesn’t stain from grease or burn damage. It won’t even smell of smoke when you’re done. Durable and hard wearing, it’ll work as well in your oven as it does on the grill, so it’s a great all-year tool to own. 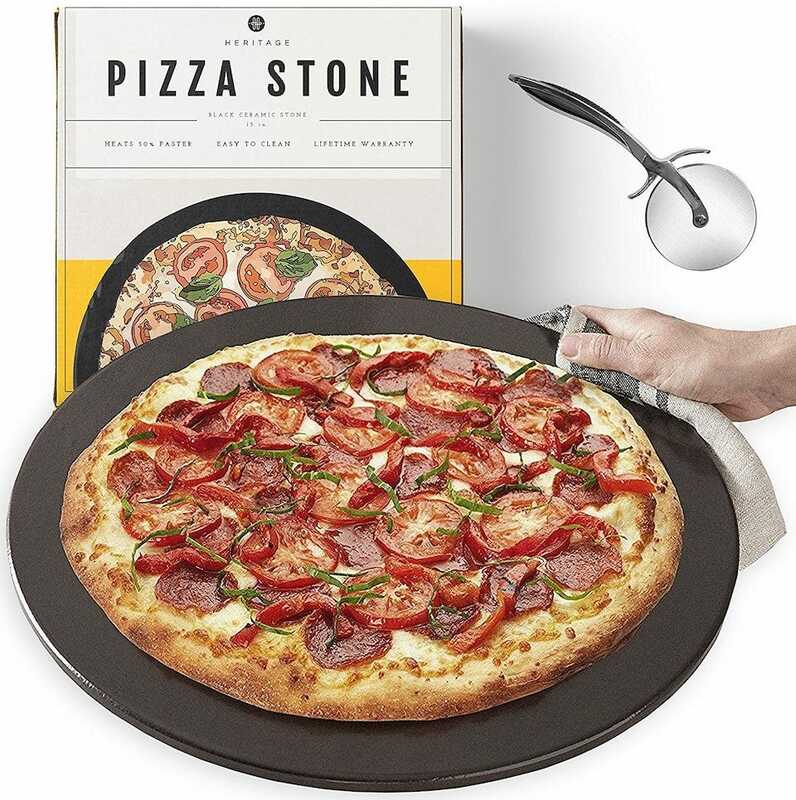 The pizza stone also comes with a free pizza cutter, so you’re good to go as soon as it arrives. If you’re keen to do something a little different this summer, it’s a great solution. So you’d like to get a monitor for your laptop, or perhaps expand your desktop to two. But monitors don’t come cheap…actually, they do! Here are the best frugal options on the market.